As promised for this Monday morning I bring you a picture of some cows…. I am not brilliant at photography, and, to be honest, due to the way the light was hitting the screen on my phone I had absolutely no idea how this picture was going to come out, all I could see was black, so I aimed the camera in the general direction of the cows and hoped for the best. Agreed, it may be a little blurry but this is because I had Sid tugging on the end of a lead causing me to wobble and the freshly used poo bag to bounce against my thigh – oh the glamour! Anyhow, to prove that the cows are in the picture I have a cropped image for your perusal. For your interest, my house is behind the tree on the left. Tomorrow: Incontinence Pads – Who Should Pay??? A nitty-gritty exposure on the horrors of being a resident in a British nursing home. 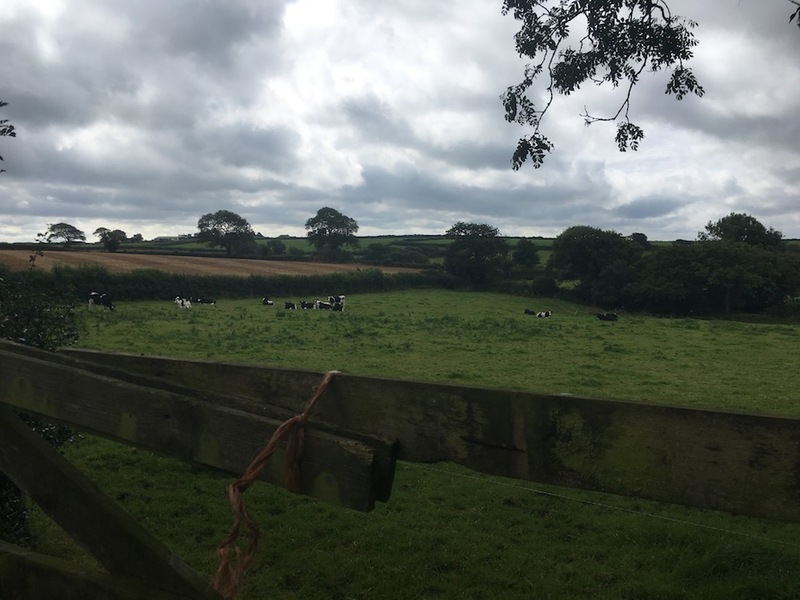 This entry was posted in Personal, Silliness and tagged Blogging, cows, dark skies, Devon, greenery on August 14, 2017 by Scarlet. Oooo-er. Silly really, but I’ve yet to be persuaded that the intentions of cattle are entirely friendly. In short they give me the heebeejeebies. Citronella says that I’m being daft, but d is the better part of v and so forth. Do take care on your perambulations Scarlet, won’t you? Well, Mr Batarde, if you get in their way when they are spooked then they will probably trample you…. but they are usually just chewing the cud, and philosophising about Donald Trump, so they are mostly harmless. Eryl – thankfully it stayed dry until I got home and it chucked it down this afternoon… I often do get caught it a downpour…. but that’s a good excuse for extra biscuits. I would devour the whole tin of biscuits – roll on Winter! Indeed, Mr Mags, death by a startled cow is not recommended…. but it happens. You are spooling us with the omelettes, Mr Devine…. I break too many eggs trying to remember where to find the….. hang on a sec…. what is this spooling of omelettes??? Anyhow, what is wrong with a good old fashioned MOO???! Sorry, no IDV, “MÜÜÜH” is not something I have heard from cows. Maybe Scandinavian cows do “MØØØ !” – but I doubt. Example here. Don’t know whether it works, sorry. It works Mr Mags….. it is like a Mawh in slow motion…. Ah. Maybe I over-egged the umlaut omelette, or something? Okay, I get it…. next time I will record the cows. They make an interesting sound when they are in the neighbouring field late at night…. I will make a note to start a Guess the Sound competition. A cow stepped on my foot.I never knew there could be so much blood in one toe! Actually, it was no longer *in* the toe, but in my shoe. Maybe it’s a sad reflection of the economy? And let us not forget that a donkey once stood on me, Dinah! No blood though. Did your toe recover completely? Devon farmers make do and mend…. I think it would be like this whatever the economy was doing. Sometimes they make do and mend with dire consequences, I have heard some horrific tales featuring electricity…. and electrocution. Did my toe mend? Yes. And no.Did you not notice how i came down the steps sideways? Why the barbed wire, when an old piece of washing line will do???! I’m just happy that we got pictures of the cows (however murderous, or not, they may be) rather than the poo bag! I know, Mr Devine!! It’s thrilling to come home and find the black screen actually made a half decent picture! I will keep the poo bags to myself, and let us be grateful that I don’t have a scratch and sniff blog. I am very grateful. Although, I can see (smell?) the scratch-n-sniff technology being used to wild abandon at The Very Mistress’s when it does become available (although I think LX may have to assist The Mistress with its installation). Where is Mr Lax? Has he fainted at the sight of two posts from Wonky Words popping up in his feed reader? Does he need the smelling salts? I hope he is okay. Perhaps he is hard at work with a roll of tin foil? Ah, yes, that will be it then! I will note down the tune for use at a later date. freshly used poo bag bounce – now that could be a disgusting new dance. However possibly not as disgusting as an essay on Incontinence Pads. Nice looking cows – that’s no bull. Bill – Thankfully the plug has been pulled regarding the essay on incontinence pads and the idea has been flushed. The cows are very well looked after in Devon! I’m not sure why the comment arranger thing put my previous comment under this one above. I do like that new title for a possible Karen Carpenter parody song. I know!! It took me a while to get the hang of how comments work on WordPress…. I suppose it’s part of the fun! I was surrounded by cows whilst staying a few days in a farm house built in the 1820s! I surrounded by cows all the time, Mr Lax…. and my house was built in the 1920’s!!! Poo bags and incontinence pads. Scratch ‘n’ sniff indeed! It’s getting terribly vulgar here, Ms Mistress…. I should snap on my rubber gloves and clean up my act. Where’s Mr Beastie and a bottle of Febreeze when you need them? Plus, Jean has started me thinking about those damn bottles again and my inner pain due to never finishing that sorry tale. Ooo….. nice neighborhood n probably fresh milk too. How lucky. 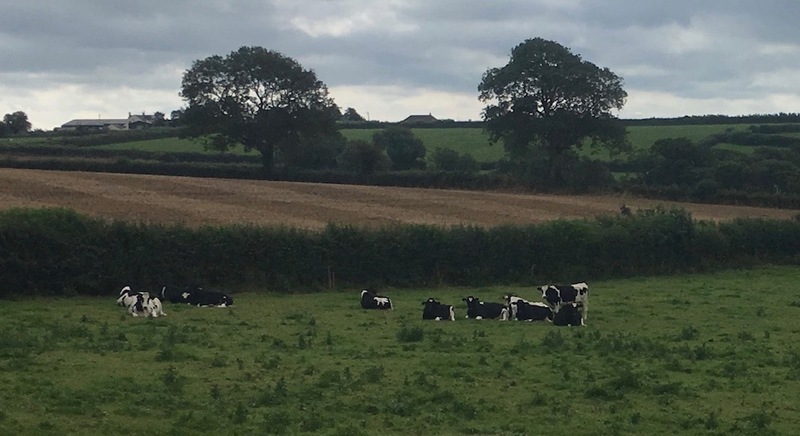 Mr Squirrel – Several times I have popped out to the shops for a pint of milk only to be delayed by a herd of cows moving from field to parlour – oh the irony! 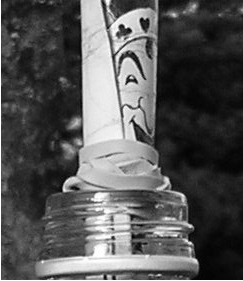 what ever happened with the messages in bottles? i am new to this blog – so the answer may be posted somewhere – but i’m not sure what direction to go to find it. As with all blogs the newest post will be on top and the whole thing will make even less sense!! I adore cows, lovely placid creatures. My old house used to back onto Beverley Westwood where bulls are free to roam, I’d often get the odd straggler coming into the garden to take advantage of my lavender hedge. I used to coax it out with a slice of bread before it shat everywhere. Mitzi – I always make sure I close my gate…. I have seen the odd straggler in the lane eyeing up my potted mint…. and as I have said at Mr Lax’s – Sid eats EVERYTHING! Whenever I see cows I always think “Sirloin”. Honestly Jon!!! I saw a calf born in a field earlier in the year…. I was walking passed and it just popped out – brought a tear to my eye as all the other cows gathered round. I no longer eat beef, or lamb. Your life looks as exciting as mine, but I don’t have a dog. Every time I see cows I think ‘dinner.’ Too bad for them they’re delicious. Not their fault. Just a unfortunate gene sequence, I suppose.